One man, David Birnbaum, has stepped forward with a new paradigm proposing to unify these three overarching fields via his signature Theory of Potential. The original and dynamic proposal has resonated globally. Since mankind emerged from the Dark Ages, science has been a guiding light for enlightenment and understanding of the universe. It promised to solve the mysteries of the cosmos and creation, and to give mankind the final answers it has sought. In many areas science has succeeded quite admirably; however, as regards the truly ‘big questions’ it has essentially been frustrated to date. Dysfunctionality has crept-into the process. Like a young child presented with a complex math problem, the entrenched power hierarchy of the orthodox scientific community has cavalierly branded the universe as ‘aimless’ and without purpose. How come? Because this same scientific hierarchy has been unable to explain the universe. This ‘aimless’ schema is sometimes referred-to as the Randomness-atheistic theory. Moreover, overzealous elements of the group have attempted to stymie and delegitimize any intellectual challenge to their ‘theory’ and to their entrenched political power in the academic community. Stepping up to challenge this monopoly on discourse by the ‘entrenched orthodoxy’ is private scholar David Birnbaum of Manhattan. Yeshiva-educated and Harvard-educated, David Birnbaum has entered-the-fray not as a challenger of science, but as a defender of science in its true form – with an original, sophisticated, and elegant metaphysical theory. Birnbaum is the quintessential ‘outsider,’ but has a quite broad and erudite grasp of the multiple intellectual battlefields in-play – classic physics/quantum physics/astrophysics, mathematics/fractals, chemistry/biology/evolutionary biology, philosophy/metaphysics and religion/spirituality. Further distinguishing his particular situation, Birnbaum’s expertise-in-depth is not tunnel-focused on just one discipline at-a-time; rather, Birnbaum adroitly integrates the multiple fields into one dynamic continuum. But his greatest skill – and the one which might just yield him immortality – has been his ability to cut through all the myriad fields and discern the ‘common denominator’. With a sophisticated ‘intellectual command’ of the multiple disciplines and having conceptualized an integrated metaphysics, Birnbaum makes-his-move. He respectfully and gingerly takes-the-hand of the ‘insider’ orthodox scientific and philosophical establishments. 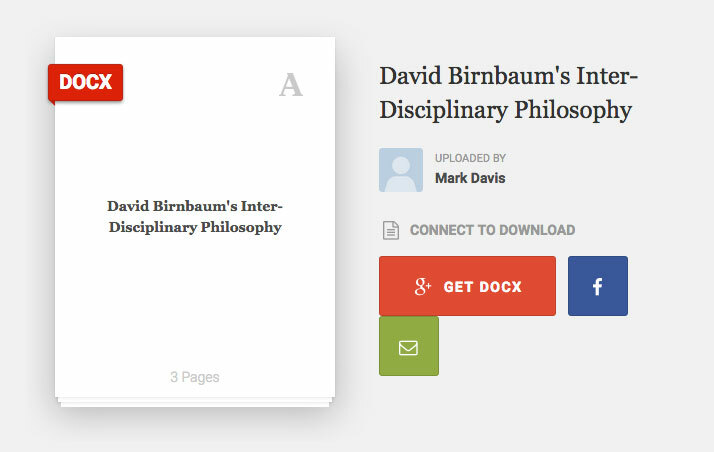 Birnbaum proposes an elegant ‘algebra of philosophy’ and ‘calculus of the spiritual.’ Bringing-to-bear his core strength as a creative conceptual theorist, Birnbaum offers academic science and philosophy an integrated metaphysics complete within an arsenal of new conceptual tools to understand the universe in its inter-related totality. The Quest for Infinite Potential addresses the elusive question of Teleology – discerning a purpose to the universe. Where science and contemporary academic philosophy find no answer, Potentialism Theory makes a strong case that the very drive of the universe from time immemorial is Quest for Potential∞ - the dynamic of driving the universe and its myriad components towards ever more wondrous Potential. According to Birnbaum, this is the ‘divine cosmic imperative’; this is the (long-sought-after) ‘prime cosmic mover’ which ignites, energizes and drives the universe. Not only does the Quest for Infinite Potential transcend science, philosophy and spirituality, it also achieves the hitherto elusive Holy Grail of intellectual inquiry of the past 5,000+ years: the unification of the three great fields – Science, Philosophy and Spirituality. Potentialism Theory is simple, yet sophisticated; it is graspable, yet profound. Birnbaum’s iconic 3-volume treatise – crafted over several decades (1982-2013) – takes us on a magical winding cosmic journey. Many sundry key players get-a-hearing. A partial list of the eclectic group would include Aristotle, Irenaeus, Maimonides, Aquinas, Gersonides, Isaac Luria, Isaac Newton, M.C. Luzzatto, Rav Isaac Kook, Albert Einstein, Victor Frankl, Teilhard de Chardin, John Passmore, John Hick, J.B. Soloveitchik, D. T. Suzuki, John A. Wheeler as well as the contemporary Paul Davies, Seth Lloyd and Thomas Nagel. David Birnbaum ranges wide and far. Many groups interject: Platonists, Process Theologians, Deists, Taoists, Kabbalists, Hassidics, Quantum theorists. But Summa Metaphysica always stays very clearly fixed and focused on Birnbaum’s own ‘North Star,’ his ‘spinal column of the cosmic order’ – potential. Birnbaum challenges; Birnbaum coaxes; Birnbaum cajoles; Birnbaum prods. He breaks many contemporary ‘rules and strictures of contemporary academic philosophy.’ He ‘goes for the gold.’ He vectors onto one seemingly simple theme: Infinite Potential. Birnbaum then force-multiplies it – and projects it out to infinity. Infinite Potential becomes his metaphysical sword to slay all dragons on his inexorable quest for the elusive overarching Holy Grail unifying core theme of the cosmic order. The theory embraces the possibility of the co-existence of the key tenets of the three great fields noted; it illuminates how they can rationally co-exist in a mutually-supportive cosmic symphony. Louis Dupré, noted Yale authority on the history of metaphysics wrote of Birnbaum's Potential theory (1988) “original, promising and...a unified metaphysics”; John J. Collins, Professor of Theology at Notre Dame, called it (1988) a “new synthesis...a fascinating approach to the philosophy of religion which merits the attention of Christians and Jews alike”; Iconic anthropologist Claude Levi-Strauss called it (2006) “remarkable and profound”; Professor Andrei Alyokhin of University of Maine wrote (2012): “It is reasonable to propose the Quest for Potential as a working hypothesis for…the cosmic dynamic.” Professor Masako Nakagawa of Villanova called it (2013) “a poetic-spiritual masterpiece”; Professor Benjamin Blech of Yeshiva University has called it (2013) “an intellectual and spiritual tour de force.” To date no flaw has been discerned in the theory. Birnbaum tackled these issues head-on in his three part treatise, Summa Metaphysica I: Religious Man: God & Evil (1988), Summa Metaphysica II: Spiritual Man: God & Good (2005) and Summa Metaphysica III: Secular Man: The Transcendent Dynamic (2014).This work has received quite significant academic and theological acclaim. As well, over a dozen journals have featured Birnbaum’s Summa Metaphysica and its Theory of Potential. In this work, Birnbaum addresses directly the metaphysical questions whose answers have eluded both the scientific and philosophical communities. Included would be Cosmogony, Theogony and Theodicy among others. The work offers both a scientific and metaphysical framework for them as well as for the spiritual community to understand one another’s interdependent and interlocking roles in the universe. To the scientific community, Birnbaum addresses the necessity of evolution and how it fits neatly within the Quest for Infinite Potential. Indeed, evolution is an expression of the universe’s striving purposefully, not aimlessly, towards its Potential – an expression of its quest towards extraordinariation. Summa's Theory of Potential actually preserves and enshrines the theory of evolution in its rightful place as a mover of the universe as a whole, incorporating the rigorous scientific research that has so meticulously crafted the theory to-date. Even more, Summa's Theory of Potential offers the academic scientific community a matrix extending well beyond classic evolutionary theory, i.e. a metaphysics delineating how any why it exists – as well as a more sophisticated proposal for the mechanism of Natural Selection. Finally, to the philosophical community, Birnbaum, through the Quest for Infinite Potential, gives a clear, concise and logically consistent theory to unify the seemingly fractious secular and religious. Daring both methodologies simultaneously, Summa's Potential Theory not only provides proof through inference of Potential as a universal axiom, but also neatly proves itself through deduction that the universe implicitly necessitates the existence of Potential and Possibility: We exist; therefore there was – by definition – the potential/possibility that we would someday exist. Indeed, Summa's unifying Theory of Infinite Potential is so compelling in both its elegant simplicity and its powerful logic, that Bard College (Upstate NY) gambled in initially breaking-ranks with the entrenched academic establishment and featuring Summa Metaphysica as its centerpiece for its multi-day international academic Conference on Science and Religion. The conference proved an apropos venue for Summa's Potential Theory by virtue of what the Quest for Infinite Potential represents. Birnbaum's theory offers logic, reason and reconciliation to intellectuals and truth seekers across traditional battle lines. Summa shows the ‘common fount’ of science and spirituality. Infinite Potential mandates that not only can these disciplines co-exist, but that of necessity they must co-exist and mutually re-enforce. Over the four-day span of the conclave, the term ‘aesthetic elegance’ was used more than several times by conference panelists to distinguish Summa’s theory.